Published on April 17, 2010 in COP, Elections, General T&T, NJAC, People's Partnership, PNM, Politics, UDeCOTT, Uff Report and UNC. Closed Tags: Basdeo Panday, Calypso, Jack Warner, Kamla Persad-Bissessar, Keith Rowley, Patrick Manning, Pennelope Beckles, Politics, T&T Govt. T&T will go to the polls to elect a new Government in 38 days, on Monday May 24, 2010. PRIME Minister Patrick Manning yesterday named May 24 as 2010 General Election day in what he has ensured is to be one of the snappiest of snap elections. Riiight! The reason the PNM lost the election in 1995 is because, after eight people sat in a room with the Prime Minister and decided on the date, some turncoat leaked it to the UNC. Demonstrations again greeted the screening committee of the People’s National Movement at Balisier House yesterday as vociferous supporters of former Arima MP Pennelope Beckles and St Ann’s East Anthony Roberts tried to sway the committee to their choice. “Who is Enill?”, that was the burning question among many residents in the Santa Cruz area yesterday. “I want to see Patrick (Manning) and (Keith) Rowley hold hands and say all is honky dory. I want to see Patrick and Rowley hold hands and I want to hear Rowley tell Patrick that UDeCOTT was a joke and that Calder Hart never existed. And I want to hear Patrick tell Rowley ‘I never call yuh wajang’.” So declared UNC Chairman Jack Warner last night, as he addressed a public meeting at Emerald Plaza, St Augustine. CONGRESS of the People (COP) Political Leader Winston Dookeran says citizens of this country must see the upcoming general election as more than just an opportunity to remove the People’s National Movement (PNM) government led by Prime Minister Patrick Manning. 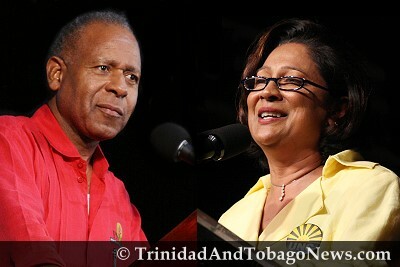 Sources yesterday reported that after marathon talks between both parties, involving UNC political leader Kamla Persad-Bissessar and COP political leader Winston Dookeran, it was agreed that the UNC would contest 23 of the 41 seats. The COP would contest 16 seats. Neither party would contest the two Tobago seats, for which the UNC has come to an agreement with the Tobago Organisation of the People (TOP). WELL-KNOWN psychologist Anna Maria Mora is expected to be screened today by the Congress of the People (COP) potentially to stand for the seat of Arouca/Maloney. Those being screened for the COP slate include many well-known party activists. Winston Dookeran, leader of Congress of the People (COP), is unlikely to face the May 24 polls. The United National Congress (UNC) and the Congress of the People (COP) have finally reached an agreement and will join forces to battle the People’s National Movement (PNM) in the May 24 general election. UNC leader Kamla Persad-Bissessar yesterday adopted a line of her former political guru Basdeo Panday. “Politics is a civilised form of war,” said Persad-Bissessar, in explaining why details of the agreement between United National Congress (UNC) and Congress of the People (COP) would not immediately be revealed. She said she did not want political “enemies” to know details of the agreement. She said the “nitty-gritty” details are still being worked out. The tassa drums rolled and Tabaquite MP Ramesh Lawrence Maharaj danced on screening day at the UNC’s Rienzi Complex, Couva, headquarters yesterday. He was accompanied by dozens of supporters holding placards and chanting ‘We want Ramesh’. Ramesh Lawrence Maharaj said yesterday that he was saddened by the attack on his opponent, attorney Anand Ramlogan, whose San Fernando office was fire-bombed on Wednesday morning. Beware of those who try to divide the country using race. That was the message of two speakers-former Oilfields Workers’ Trade Union (OWTU) president Errol McLeod and deputy leader of the National Joint Action Committee (NJAC) Nyahuma Obika, at a Congress of the People (COP) meeting in Pt Fortin on Thursday night. Leader of the Jamaat-al-Muslimeen, Imam Yasin Abu Bakr, vows to tell all when he launches the campaign of his political party the New National Vision (NNV) on Wednesday. The NNV will launch its campaign for this year’s general election at the Croisee in San Juan at 6.30 p.m.
PRIME MINISTER Patrick Manning’s decision to announce May 24 as the date for general elections, via fax yesterday, led to the business community and trade unions expressing relief. RETIRED trade unionist Errol Mc Leod at a Congress of the People (COP) meeting in Point Fortin Thursday night, urged supporters to ensure that no seat could be considered “safe” for the ruling PNM in the May 24 general election. AFTER eight days of bewilderment, speculation and prodding, occasioned by the suddenness with which he moved to have Parliament dissolved on April 8, Prime Minister Patrick Manning yesterday announced May 24 as election day. Like the decision to dissolve Parliament in the middle of a five-year term, Prime Minister Manning’s seven-day delay in calling the general election is strange and puzzling. It is unprecedented in the country’s 48 years of post-Independence history—and the 11 general elections held in that period—for the Prime Minister to dissolve the Parliament and then not call the elections immediately. The Prime Minister may have been swayed to his choice of May 24 because that date is the anniversary of the 1971 general election that would have propelled a young, geology graduate named Patrick Manning into Parliament on the back of a no-vote campaign, led by ANR Robinson, which resulted in the ruling party sweeping all 36 seats.